The upgraded continuous pyrolysis unit TDP-2-200 was shipped to Switzerland to the industrial site of Wiederkehr Recycling AG. 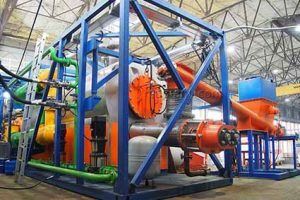 The equipment is designed to process crushed automotive scrap with production of synthetic fuel, pyrolysis gas and dry residue. Innovated TDP-2-200 features an improved gas cleaning system including a wet scrubber and an activated carbon filter. Such a solution was required to satisfy the particular requirements of the Customer and the Swiss legislation, with its strict environmental protection stipulations. TDP-2-200 plant has been certified to comply with the requirements of the European Directive 2006/42/EC. The international certification body TÜV NORD based on the results of the tests issued the certificate on the safety of machinery and equipment.